"And yet there it was, an empty locker flanked by an empty chair to match the emptiness in the air. "St. Louis manager Tony La Russa empowers Pujols to do what he pleases, right or wrong, even if it’s the equivalent of ordering the lobster-stuffed filet and sticking the minimum-wage worker with the bill. He will face no discipline. He never does." 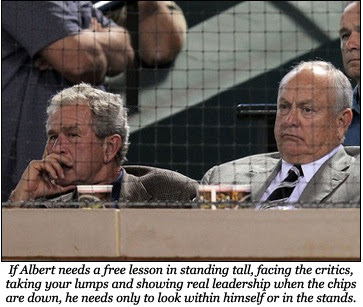 After Pujols' error cost the Cardinals a win, the people who took responsibility were the players who didn't bear any. In the visitors' clubhouse were sounds of joy. In the home clubhouse were sounds of silence. From Albert Pujols. Leaders, in a word, lead. They do the right things in the right moments, seizing intangible guidance from baseball's atmosphere. They speak so teammates don't have to. They know that words said off the field can translate to success on the field. Derek Jeter is a leader. Some people thought the Boston Red Sox had leaders from May-August. September showed us they did not. Some people might think that Pujols' three incredible moon shots wipe away the lack of character he showed after Game Two, but teammates don't forget. If he wanted to make a big hit, he should have done that with his brothers in arms. The hits and homers he should have made were ones that hit close to home—in the hearts of the people who go into battle with him every day. Instead, Albert Pujols made a pitch for himself, joining the ranks of the famed glory hound, Reggie Jackson, Mr. October, he of the candy bar. Pujols was content to stand in the batter's box, twirl his bat over his head and try to swing for the biggest and most eye-catching moments in a baseball game. Did Pujols get down a sacrifice bunt or steal to manufacture runs and play the game the right way? Did he stay out of the light in the offseason, lose weight, choke up on the bat and grow a playoff beard? How many intangibles did he even have in that game? Albert Pujols can't tell you. What he can tell you is his stat line: 3 HR for 6 RBI in a 5-for-6 performance. He can talk about how well Albert Pujols did. He can talk about compiling stats for Albert Pujols. Maybe it's time for someone to talk about the team instead. Our publisher, Marty Peretz, is neither responsible nor liable for any content in this site, including but not limited to words, ideas, images and things implied by said means of communication, in addition to other forms of communication not involving the above methods, whether established or theoretical in nature.